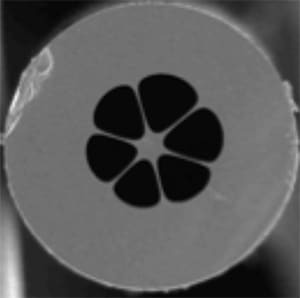 The multimode (MM) Grapefruit type (AsSe) Chalcogenide fibers have low transmission loss over a wide bandwidth of operation from 1.5µm to 9µm and large numerical aperture that allows easier light coupling into the fiber. Some MM Grapefruit fibers are available in stock, and can also be custom drawn to many different fiber geometries and specifications. These fibers can be used for efficient delivery or transmission of laser power.